New York vigil for LGBTQ people murdered in Orlando | Fight Back! 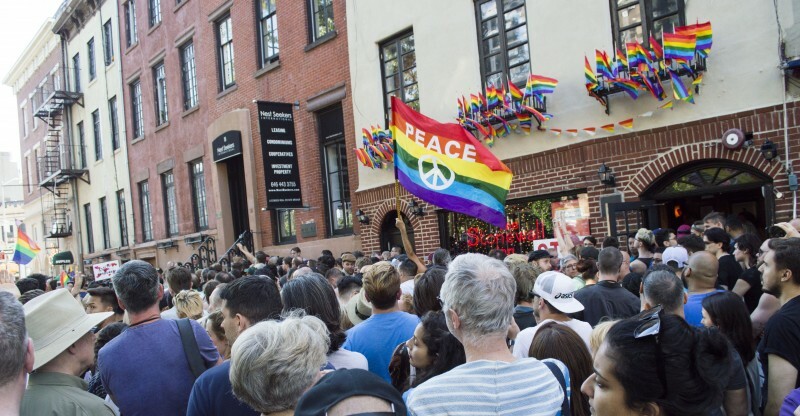 New York, NY – On June 12, at 6 p.m., over 600 people gathered at the steps of the historic Stonewall Inn to mourn the lives lost in the Orlando Massacre that happened earlier that day. In the early hours of June 12, Omar Mateen entered the popular LGBTQ Orlando nightclub, Pulse, and opened fire. The club was hosting a Latin night that featured a trans-woman headline. Mateen killed 49 people and injured 53 before being shot by the cops. While the bourgeois media assumed that his motives were linked to Islam, reports from Mateen’s family state that he was never religious. Closer investigation revealed that Mateen worked for G4S, a security systems company that provides surveillance equipment to Israeli prisons. Pictures of Mateen wearing NYPD shirts also surfaced and made the rounds on social media. It seems likely that his motives were closely related to homophobia rather than religious belief. The vigil was organized by a local New York group Queer Nation-NY and several other community organizers. The topic of the speeches ranged from expressing sentiments of remorse, sadness and love, to calls to action and revolution. As the sun set over Christopher Street, the attendees had heavy hearts but were galvanized to keep fighting for justice.